This chart may not reflect all of the equity investment activity in the robotics market but it is a far cry from the $6.9 billion that went into 997 venture funded deals in web and Internet startup companies over the course of 2011. This chart also doesn’t mention the many acquisitions, strategic partnerships and mergers that occurred. The most recent is the acquisition of French Cybernetix by Technip, an oil resources and ROV service provider to the industry. Robotics companies have large capital requirements for robot hardware, few potential acquirers, and almost no “Google-scale” breakout success stories (i.e., IPOs). One of the best known robotics companies, iRobot, has a market cap of just $700 million. This makes robotics a difficult sell to your typical VC firm. Although these 14 companies represent just a sliver of the 100+ robotic startups that are getting funded in one way or another, they do offer insight into those that are of interest to the venture capital community. Of the companies listed in the chart, it is interesting to note that two are foreign and the biggest investment is for a robotic hair implant device for balding men. VGo telepresence robot, Harvest Automation’s nursery robot, Liquid Robotics’ wave glider. Restoration Robotics and their new ARTAS System provide image-guided technology for hair follicle harvesting. It’s a massive market, hence the large investment. They received US FDA clearance mid-2011 and treated their first patient in August, 2011. Redzone Robotics was featured by Pres. Obama last year and, in addition to the 2011 funding, received an additional $8.5 million just a few days ago. Their wastewater systems – pipe inspection and cleaning robots – provide critical environmental assistance to municipalities, contractors and engineering firms. Again, a big investment for a big marketplace. Liquid Robotics and their wave gliders have been much in the news. They presently have four wave gliders traveling different paths across the Pacific and making their data available to scientists and lay people worldwide. Their gliders are valuable additions to the arsenals of scientific and environmental agencies, fisheries, aquaculture, pollution detection and resource discovery companies as well as defense/security and law enforcement agencies. Hence the large investment. Aldebaran Robotics, a French company, makes the Nao and newer Romeo robots which they sell to schools and for robotic soccer and other competitions to promote STEM education, a limited but growing marketplace, hence the midrange venture investment. Medrobotics is a Carnegie Mellon spin-off focused on surgical applications using flexible snake-like robotic devices for minimally-invasive procedures. Like other medical start-ups, there is a long lead time for product refinement and FDA clearances. 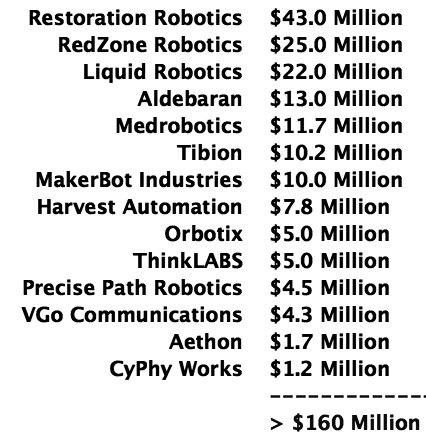 Medrobotics has received funding in almost every year since it’s inception in 2005. Tibion Corporation, is a Sunnyvale, CA start-up, providing bionic legs for stroke rehabilitation. This form of robotic-assisted rehab therapy, therapy with the use of an exoskeleton, is a big step forward from the $300,000+ fixed-position machines previously used. MakerBot Industries, the 3-D printer maker for the DIY (Do-It-Yourself) crowd, and featured at Maker Faires held all over the country to mammoth and enthusiastic crowds, services the DIY, prototyping, small run, and hobby communities while more expensive 3-D printers support the additive manufacturing sector. The Maker Faire Bay Area DIY innovation festival will be held in May in San Mateo, CA. Harvest Automation has a lot of good things going for it: (1) many of it’s investors are the very same ag businesses that will be buyers of the robots, (2) although focused on nursery automation to begin their business, they are poised to broaden their scope into many other facets of the ag industry, and (3) the key players are experienced in the business of robotics. Orbotix is the developer of the sphero smartphone-controlled robotic ball. The ball has no buttons, no battery box, no socket or cord for a charger (although it does have a cup-like charging dock). Shake it and it glows; put it on the floor and direct it anywhere with your iPhone. It’s a Bluetooth-based, wirelessly-charged device first shown at the 2011 CES in Las Vegas. ThinkLabs is an Indian education company focused on science and technology. It uses simple robots, sensor enhanced devices, and robot competitions to provide hands-on inspiration for students taking their courses. Precise Path Robotics began as an entity to participate in the 2005 DARPA Grand Challenge and has migrated it’s navigation system into robotic lawn mowing and other robotic devices to provide maintenance and conditioning robots for the golf course market. VGo Communications has thus far produced 2,000 telepresence robots and plans to lower the cost to near $2,000 in their next production run. You may have seen the ABC News stories about the high school student who couldn’t leave home but nevertheless, through the use of the VGo, attended the local high school, piloting his VGo from class to class and up and down the school elevator. Aethon is a Pittsburgh, PA based mobile robot company that makes robotic carts and tugs for the hospital industry tugs to pickup and deliver food, medicine, waste materials and general supplies. The company began in 2001 and has had many rounds of financing. This round of $1.74 million was less than the $2.5 million targeted. CyPhy Works, a maker of small unmanned flying robots used to inspect bridges and other public infrastructure, has also received federal grants and research awards to develop its technology for both commercial, governmental and defense clients.